"You don’t become what you already are. You simply allow it to be." Qi-Yo introduction | New York, 21 Oct.
Nepal remains the cultural powerhouse of the Himalayas; the Kathmandu Valley in particular offers an unrivalled collection of world-class palaces, hidden backstreet shrines, sublime temple art, and unique local flavor, as you observe Tibetan Buddhist pilgrims circumnavigating centuries-old stupas and monasteries. During our relaxing and educational trip to Bosnia & Herzegovina and Croatia, you will revel in the power of pyramids, tunnels, healing chambers, hot mineral springs, local food and spring water in Bosnia, as well as beaches, islands, waterfalls, and the city of Split in Croatia. During this retreat we will stay in and around the ancient fort city of Dubrovnik. We will practice Qi-Yo Yoga daily, enjoying lectures on Qi-Yo techniques and topics in the esoteric arts. We will also visit the city Dubrovnik, the Elaphiti islands, and Lokrum island. Summer is fast approaching, and with it the age-old chore of planning your family holiday. This is good time to consider a new retreat we are offering for the entire family or any combination of father & child or mother & child. This is a great chance for the family to reconnect while seeing the best of old and new Japan. A once-in-a-lifetime journey from Wall Street to Hollywood through Main Street, the Grand Canyon, and Las Vegas. Come with us on an ambitious, unforgettable, endlessly educational, headspinningly gorgeous 3-week journey across the United States. Reserve your space now! Qi-Yo is a multiversal approach that integrates yoga, Qi Gong, Tai-chi, shamanic Balinese healing, and other holistic modalities to jump-start personal transformation and foster creative expression. Qi-Yo Yoga offers a 200HR teacher-training program that immerses participants in yogic heritage and esoteric traditions from around the world. This is a light-filled, exciting opportunity for students and aspiring teachers of yoga. The Qi-Yo Multiversal approach brings together the best of the yogic traditions of East and West, offering an in-depth study of yoga, contextualized within the global esoteric heritage, and helping students understand the role of spirituality in a constantly fluctuating world. Qi Yo Travel offers guided life-altering tours to specially selected sacred sites around the world known for their geomantic power and spiritual force. The exploration of these sacred places lets travelers tap into the vibrant cultural, artistic and mystical heritage of a region while partaking in comprehensive transformative experience. Considered one of nature’s most perfect and ubiquitous designs, the egg was seen as divine geometry by nearly every ancient civilization, and up until modern times. The ovoid shape resonates with the current evolution of our planetary consciousness, and brings a sense of unity, warmth, and the birth of new life. It represents vital energy, liberating the will and stimulating movement. 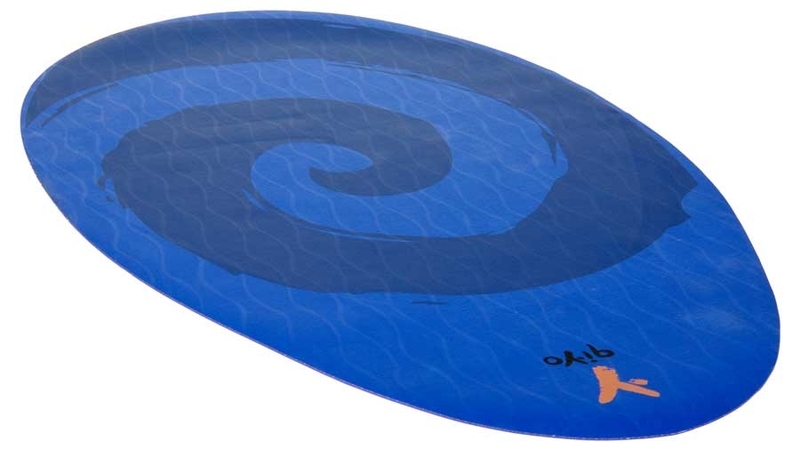 Decorated with textured blue waves and a spiral graphic print on its blue side, the mat features a Flower of Life pattern embossed on its purple side. At our retreats and workshops we teach you the principles of Qi-Yo yoga, providing you with information from different perspectives and philosophies. We give you keywords as inspiration to educate yourself, connect the dots, and awaken the master within. Together, we create an experimental field free of dogma, evolves constantly, and welcomes everyone's inner wisdom and point of view. If you so choose, you can have lifelong support and guidance from our teachers by joining the worldwide Multiversal community. The goal is not to make you dependent or part of a cult, but to create a worldwide network of awakened masters. We offer workshops, retreats, and inspiration trips all around the world – in the most beautiful places and sacred sites – to experience different cultures, energy vortexes, and discover the world in all its richness. Qi-Yo proposes a more holistic concept of nurturance and unity and challenges the current cognitive education forced upon our children today. Focusing on liberation as the first step of personal transformation, Qi-Yo teaches universal principles of body-mind-spirit centering inherent in all spiritual teachings. The unique spiritual science education provides information and knowledge on different philosophies. Qi-Yo is a multi-yoga school on wheels. Spiritual travel and holistic research is the cornerstone of the method. By encountering different ethnicities, cultures, situations, and perspectives we are inspired to explore the wide world beyond ourselves. Becoming compassionate and empathetic, we are able to walk the path of the Tao and awaken the master within. Sound healing therapy improves many facets of one’s life, including emotional and social development, cognitive and motor functioning, as well as psychological health. Tibetan Singing Bowls have been used for centuries in healing and meditation. In the right hands, they produce a range of sounds that, over time, restore the normal vibratory frequencies of diseased or disharmonized regions of the body, mind, and soul. Using yogic, pagan, and shamanic ritual tools to elicit higher states of consciousness, Qi-Yo ceremonial magic offers a series of individual and group rituals aimed at greater strength, purification, clarity, and direction.